Tiemoue Bakayoko has indicated that he wants to stay put with AC Milan once his temporary stint from Chelsea expires in the summer. The French midfielder was deemed surplus to requirements upon Maurizio Sarri's arrival last year and he was thereafter loaned out to the Rossoneri for the campaign. His beginning with the Milan giants was far from impressive but he has since produced a series of good displays which have encouraged talk of the Rossoneri sealing a permanent deal. 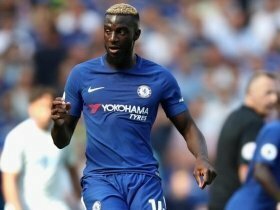 Amidst this, sporting director Leonardo has acknowledged that a permanent move for Bakayoko may depend on whether Milan qualify for the Champions League or not but the Frenchman still remains hopeful of an agreement being reached between the sides. "It's an issue that concerns Milan and Chelsea. Staying at Milan is my dream and the fixed thought in my mind, but I have a contract with Chelsea.," he told Corriere dello Sport. Bakayoko has featured in 15 of the Rossoneri's 21 Serie A matches this term. The Milan giants are currently occupying the fourth position in the standings which would assure them of Champions League football for next term.